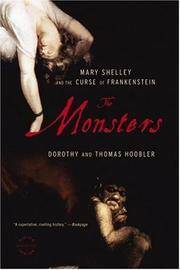 The Monsters: Mary Shelley and the Curse of Frankenstein. By Dorothy and Thomas Hoobler. Boston: Back Bay Books, 2007. First Paperback Edition Pictorial Wraps FINE in WRAPS 8vo (5-1/2 x 8-1/4), 374 pp including Index and Reading Group Guide. In 1816, a few people had gathered at Lake Geneva for a weekend picnic and retreat -- but the weather was terrible and they stayed indoors. The poet Byron set up a contest -- who could write the best ghost story? Mary Wollstonecraft Godwin (later Mary Shelley) wrote "Frankenstein." Less well known is that Byron's physician, John Polidori, also wrote a book -- the first vampire novel. The Hooblers take us into that weekend of writers competing with and inspiring each other using letters and rarely seen archives. Madeira Park, BC: Harbour Publishing, 1998. First Edition, Firfth Printing Glossy Pictorial Wraps NEW 8vo (6-1/2 x 9-1/2), 269 pp. Softcover book is NEW in NEW glossy pictorial wraps. 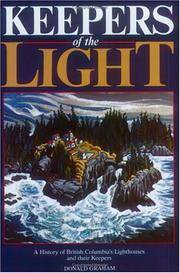 (h) A wonderful book with well-written well-researched histories of 23 lighthouses and one shipwreck (The Valencia). Lighthouse histories start with first settements of the location and tell the fascinating story from there. Profusely illustrated with B&W photographs. Make s a wonderful gift. Legend of Good Women: Medieval Women in Towns and Cities. By Uitz, Erika; translated from the German by Sheila Marnie. Mt. Kisco, NY: Moyer Bell Ltd, 1990. First U.S. Edition Cloth AS NEW in NEAR FINE DJ Square 8vo (8 x 8), 200 pp including Notes, Index, Bibliography. Hardbound book is FINE -- Unmarked, Unread, and AS NEW in NEAR FINE pictorial DJ (2 tiny chips on back/bottom of DJ -- otherwise also AS NEW. Cloth cover is AS NEW tan cloth, a medieval woodcut incised in black on the cover and spine, withauthor's name on spine in red. (h) The author's focus is the changing role of urban European women that began in the 12th century when a window of freedom opened for them, allowing the beginning of a true middle class, which freedom lasted until the 15th century when their roles were once again defined for them. This opening of possibilities allowed women to act on independence. They became merchants and traders, some travelling, others becoming shopkeepers. Still others worked in crafts with textiles or groceries, creating women's guilds, becoming innkeepers, doing medical and social work, also becoming artists as well as prostitutes. An extraordinarily well researched study of a little-known social period. 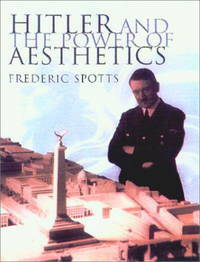 Hitler and the Power of Aesthetics. Woodstock & New York: Overlook Hardcover, 2003. First Edition 1/4 cloth AS NEW in AS NEW DJ 8vo (7-1/4 x 9-1/4), 456 pp including Index, Source Notes, and a list of Books Cited in Text. Book is FINE -- Unmarked, Unread, and AS NEW in Unclipped AS NEW pictorial DJ. (h) He considered himself an artist, and, like many other dictators (Stalin, etc) insisted that art be "pure" and in his aesthetic range, all other being "decadent." But even more than that, he saw the Third Reich as a state that would express itself in both art and sports. He was building a new culture and a new aesthetic. His intentions toward art were as strong as his obsessive racism. A brilliant book. Witness for Peace: A Story of Resistance. Louisville, KY: Westminster John Knox Press, 1991. First Edition, First Printing Glossy Pictorial Wraps NEW 8vo (6 x 9), 237pp. Trade Paperback is NEW -- FINE, Unmarked and Unread in NEW Unmarked glossy pictorial DJ. (h) This is the story of men and women who went -- unarmed -- to be witnesses in Nicaragua, and whose presence as unarmed US Citizens prevented attacks by the Honduran-based Contras, ultimately -- probably -- preventing Central America's strife from developing into another Vietnam. A largely untold story about a largely unseen war. An inspiring story of what simple unvarnished faith can do when it's not being perverted into a tool for political gain. Harlots Whores and Hookers a History of Prostitution. Rising Up and Rising Down: Some Thoughts on Violence, Freedom and Urgent Means (Abridged in One Volume). New York: Harper Perennial, 2005. First Edition Thus Pictorial Wraps AS NEW in WRAPS 8vo (6 x 9), 733 pp. Trade paper is FINE, unread, unmarked (except for remainder line of page block) and otherwise AS NEW in pictorial wraps. 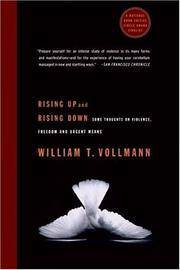 (h) Mr. Vollmann makes it clear in his Preface to the Abridged Edition, the he did it for one reason -- money -- and a fringe benefit, he says, that someone may actually read it (the original "Rising Up and Rising Down" was over 3300 pages long published in 7 volumes). The focus is on political violence and the way power is exercised using it. Completed in 1998, it of course does not include the events of 9-11-2001, but is certainly easily applicable to understanding that event and the terror and violence the followed in years since. 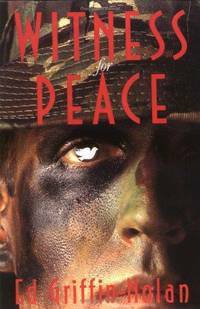 It is regarded as an historically brilliant work, comprehensive and literarily excellent, exploring the motivations and justifications for the use of violence, creating what he calls "a moral calculus." The rising and falling in the title refers to the rise and fall of organizations, whether states, empires, groups or military factions. But Mr Vollmann is probably right when he acknowledges that few people would have the determination to read the complete work, and although he poses his motives as cynical, this abridged version allows the rest of us to consider and understand his observations and conclusions. Can't Find My Way Home: America in the Great Stoned Age, 1945-2000. New York: Simon & Schuster, 2004. First Edition, First Printing Hardcover 8vo (6-1/2 x 9-1/2), 545 pp including Notes, Bibliography, and Index. Book is FINE -- Unread, Unmarked (other than small remainder mark on bottom page block) and AS NEW in AS NEW pictorial DJ. (h) Traces the elements and evolution since the end of WWII, of the "Smoke this" "Snort this" "Here try this" reality. The Beats, the post-war jazz scene, all conducted in the shadows until the 60's when it was right out in the open for everyone to see. They say that if you were really there, you can't remember it. In which case, you need to read this book and find old friends. And if you weren't there, you need to read this book to understand how it all got from there to here. Well researched and well written. 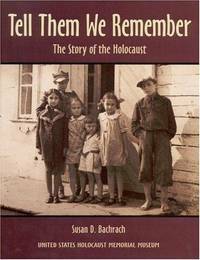 Tell Them We Remember: The Story of the Holocaust. By Edited by Lynn T. Smith and Alexander Marchant. New York: Dryden Press, 1951. Not Stated Cloth NEAR FINE, no DJ. 8vo (6-1/4 x 9-1/2), 466 pp including Index, Glossary, Notes on Contributors, and 32 pages of B&W photographs and drawings. Book is Unmarked, apparently Unread, and NEAR FINE (with only minor bumping on spine and corners). All pages are bright and clean and tight. No DJ. 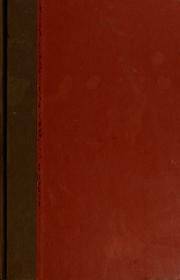 (mk) Green clothbound cover with title in red type. This is a classic with major academic contributors from Universidade de Sao Paulo, Universidade do Brasil, Columbia, Vanderbilt, Syracuse, Brigham Young, and contributions from Brazilian government officials. and other sources. History, geography, languages, tribal groups, political, legal, cultural, and other aspects of life, flora, fauna, law and scoiety in Brazil through the end of WWII. A classic. 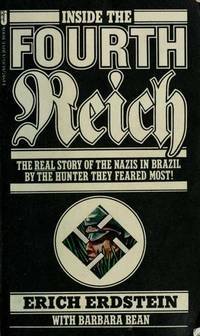 Inside the Fourth Reich: The Real Story of the Boys From Brazil. By Erdstein, Erich; Bean, Barbara. New York: St Martin's Press , 1977. First Edition Cloth AS NEW in FINE DJ 8vo (5-1/2 x 8-1/2), 220 pp. Hardbound book is FINE -- Unread, Unmaerked and essentially AS NEW. Glossy pictorial DJ also FINE with no rips or tears of creases -- spine is slightly faded by sun, otherwise perfect. (h) Includes articles clipped from Oakland Tribune, June 12, 1985 announcing discovery of remains of Dr. Mengele. 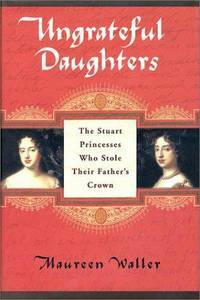 Ungrateful Daughters: The Stuart Princesses Who Stole Their Father's Crown. New York: St. Martin's Press, 2003. First Edition, First Printing Boards AS NEW in AS NEW DJ 8vo (6 x 8-1/2), 452 pp including Notes, Bibliography, and Index. Book is UNREAD, UNMARKED, and AS NEW in AS NEW DJ and mylar protective cover. (h) The ungrateful daughters were Anne and Mary, daughters of James II, who betrayed their father for poseesion of the kingdom. Well written, excellently researched, a fascinating story. 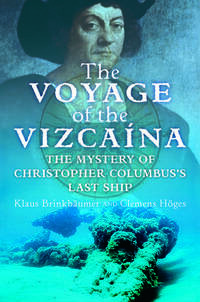 The Voyage of the Vizcaina: The Mystery of Christopher Columbus's Last Ship. By Brinkbaumer, Klaus; Hoges, Clemens Hoges; Translation from German by Annette Streck. New York: Harcourt, 2006. First U.S. / English Language Edition Boards AS NEW in AS NEW DJ 8vo (6-1/4 x 9-1/4), 328 pp including Index, Selected Bibliography, and Translator's Note. Hardbound book is UNREAD, UNMARKED, and AS NEW in glossy pictorial AS NEW DJ. (h) The authors discuss a centuries-old shipwreck off the coast of Panama, under twenty feet of water. In 2001 a claim was made that the ship was the Vizcaina, a caravel that accompanied Christopher Columbus"s final voyage to the New World in 1502 and sank in 1504. True adventure story with historical implications, since -- if proven true -- it would be the first of Columbus' ships to be found. Carbon dating has established its age, but it has not yet been authenticated because conflicting salvage claims have kept research in limbo. 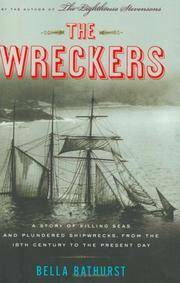 The Wreckers: A Story of Killing Seas, False Lights, and Plundered Shipwrecks. New York: Houghton Mifflin, 2005. First U.S. Edition, First Printing 1/4 cloth AS NEW in AS NEW DJ 8vo (6326 pp including Index and Bibliography. Book is AS NEW, Unread and Unmarked in AS NEW pictorial DJ. (h) This is the story of 3 centuries of British coastal people who survive -- even flourish comfortably -- on what they take from shipwrecks, for which reason they're known as "The Wreckers." Though stories link them to Cornwall, Ms Bathurst interviewed people from the Shetland Islands to Scilly, mostly people who were not wreckers themselves, or if they were, did not admit to it. A fascinating aspect of history. Les Grandes Horizontales: The Lives and Legends of Four Nineteenth-Century Courtesans. London: Bloomsbury Pub Ltd, 2003. First Edition, First Printing Cloth AS NEW in FINE DJ 8vo (6-1/2 x 9-1/2), 337 pp including index and Bibliography arranged generally and also according to each woman, plus list of relevant or useful websites. The book is AS NEW in a Fine pictorial DJ (there is a bump on the front lower corner of the DJ, otherwise AS NEW). DJ protected in Bro-Dart cover. No other marks, scratches, or flaws in either book or DJ. 8 color and 14 B&W illustrations on 8 coated pages. Les Grandes Horizontales translates -- literally and somewhat crudely -- as "The Great Lays" -- Marie Duplessis Duams' model for La Dame aux camelias), Apollonie Sabatier (La Presidente), Cora Pearl, and Blanche de Paiva. These four ruled the roost of the demi-monde when courtesans to royalty, artists, composers, and writers were widely known as celebrities. Book Junkies is located in California.